Sunday edition of "paper of record" features map from Libya to Afghanistan – but no Israel. New York State Assemblyman Dov Hikind blasted The New York Times for a map it published this past Sunday, manifestly leaving out Israel. The article appeared on page 7 in Sunday's edition regarding the Iranian-Saudi conflict, and discussed how it affected the Middle East and its role in the power struggle between many of its countries. The article, entitled, "How the Iranian-Saudi Proxy Conflict Tore the Mideast Apart," included a map of the Middle East that left out one country: Israel. Hikind said he was appalled at the omission. "I'm so disappointed and perplexed with The New York Times for leaving out the State of Israel on its map of the Middle East," he said. "Did they forget that Israel is part of the Middle East, or was it left out intentionally?" Although Israel appears almost in the center of the map, its name does not appear. Instead, Libya, Sudan, Egypt and others are marked to the south and west, Turkey, Syria and little Lebanon to the north, and Saudi Arabia, Jordan, Iraq, Iran and others are marked to the east. "I find it absolutely appalling," Hikind said, "that The New York Times would follow the lead of many newspapers throughout the Middle East that don’t accept the existence of Israel, and therefore Israel is not on the map. How can one of the most decorated publications in the world fail to even acknowledge Israel's existence on a map? How dare you call yourselves the newspaper of record!" Assemblyman Hikind demanded that newspaper publicly acknowledge the error and apologize for it. 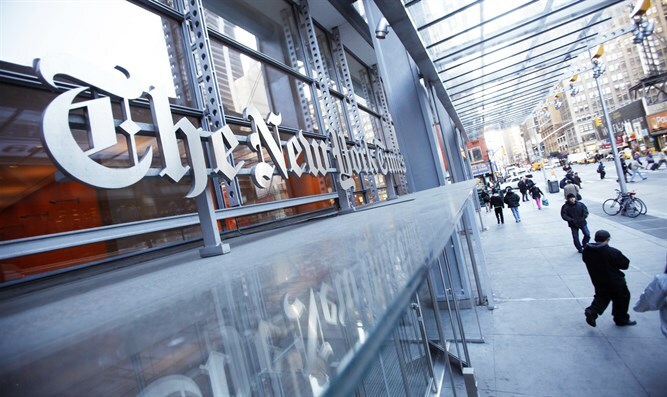 "It's evident that The New York Times is pushing a bias, slanted view against Israel, and it needs to stop," Hikind said.